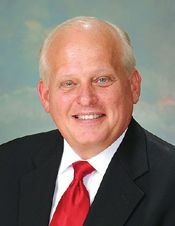 Aldine ISD Trustee Rick Ogden announced his resignation from the Aldine ISD Board of Education. The announcement came during the Board’s Nov. 15 meeting. Mr. Ogden and his wife Charlotte are moving out of the district. Mr. Ogden, who currently serves as vice-president, has served on the Board for 26 years. He was appointed in August 1990 to fill the unexpired term of Walter Stovall. He was elected to that position in January 1991. Prior to becoming a trustee, he served on the district’s Project 2000 Committee. Mr. Ogden has held all four Board offices and chaired numerous committees. A 1992 member of Leadership Texas Association of School Boards (TASB), Mr. Ogden earned the title Master Trustee. In addition to serving on the school board, Mr. Ogden has served as a director of TASB and was that group’s president in 2002-03. He has held all offices in TASB and served as the manager of the TASB Risk Management Fund Board as well as a trainer for The Center For the Reform of School Systems (CRSS). Mr. Ogden is a native Houstonian, a 33-year resident of Aldine and has four children who are all graduates of Aldine High School. Mr. Ogden is the longest-serving member of the Board of Trustees with his 26 years of service. 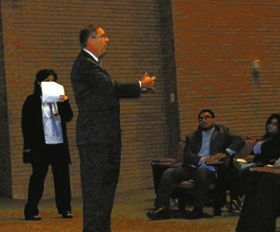 “It has been my privilege to serve Aldine ISD as part of the team of “eight” for more than 26 years,” Mr. Ogden said. “In addition to current board members, my fondest memories are centered in working with fellow trustees who worked together to create the best possible education environment for our students, administration, staff and support staff. Board President Rose Avalos spoke on behalf of the Board and thanked Mr. Ogden for his service over the last 26 years. Superintendent Dr. Wanda Bamberg also thanked Mr. Ogden for his leadership. Mr. Ogden’s resignation means the Board will need to find a replacement for his position. The Board’s Selection Committee, consisting of Paul Shanklin, Dr. Viola M. Garcia and Steve Mead, will begin the process of screening applicants. It is the responsibility of the committee to interview potential Board members and make a recommendation to the full Board. The committee will generate a list from the names of individuals previously provided by the community, Board members, the superintendent and other during the last vacancy created in 2014. The committee will also solicit recommendations for names of additional candidates. Mr. Ogden will remain as a participating member of the Board as a “holdover” until his replacement is found. Mr. Ogden’s term is up in November 2017. The person chosen for his position will run in the next election. Approximately one year after breaking ground on the $58 Million Greens Bayou Federal Flood Risk Management Project, the U.S. Army Corps of Engineers Galveston District and Harris County Flood Control District are kicking off the next project phase. This federal-local partnership project includes completion of a stormwater detention basin on 138 acres and approximately 3.7 miles of channel conveyance improvements from Cutten Road to Veterans Memorial Drive. West Greens Drive bisects the basin, dividing it into two parts, but it will be connected by means of box culverts and will function as a single flood damage reduction facility. When fully complete, the basin will hold approximately 1,650 acre-feet, or 538 million gallons, of stormwater that would otherwise threaten homes and businesses. Stormwater detention basins reduce flooding risks and damages during heavy rain events by safely storing excess floodwater and slowly releasing it back to the bayou when the threat of flooding has passed. •	Construction of the channel conveyance improvements from Cutten Road to Veterans Memorial Drive. “This project represents strong partnership between HCFCD, Stakeholders and Corps of Engineers. Upon completion, it complements Flood Risk Reduction (FRM) improvements in place and planned by HCFCD along Greens Bayou; thus magnifying FRM value along the Bayou. 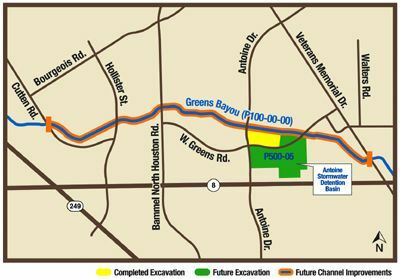 Upon completion, the project lays a foundation for other potential value added and permitted improvements by either Stakeholders or HCFCD; such permitted improvements will add to the community quality of life,” said Shakhar Misir, USACE Galveston District project manager for the Greens Bayou project. The project’s first phase of construction, which started a year ago with partial excavation of the Antoine basin’s north cell and outfall structure to Greens Bayou, was recently completed, also by Lecon Inc. This paved the way for the start of work this month on completion of the basin. Additional trees will be cut and removed from the basin’s north and south cell to allow for excavation of the basin. After construction is complete, the Corps will plant native trees and grasses in and around the basin, with wetland plants placed in low areas as part of the landscaping. They will also plant grasses on disturbed areas along sides of the bayou, and native trees where appropriate along the bayou banks. These features will improve stormwater quality, support wildlife and provide opportunities for recreational benefits. Completion of this phase of the federal project will take an estimated three additional years. ALDINE – Hundreds of students, parents, and the public met at MacArthur High School last Thursday night, to hear the school districts plans for improving the safety for students along Aldine Mail Route. The meeting was prompted by the tragic death of Jose Torres, a senior hit by a truck while attempting to cross the street in front of the high school. Torres death on Wednesday, Oct. 26 followed a similar fatal accident two days before of an adult attempting to cross a few blocks to the east. The meeting was opened by Superintendent Wanda Bamberg, and then a slide presentation and report was made by Assistant Superintendent Ken Knippel. The report focused on what had been accomplished in the last two weeks by the district and Precinct 2, who has responsibility for traffic regulations on the street. Also discussed were studies being conducted by these parties for further safety improvements in the future. Knppel pointed out that a number of agencies were involved in trying to solve the safety issues. These include State Rep. Armando Walle, METRO, CenterPoint Energy, East Aldine District, Sheriff’s department, Aldine Police department, and Aldine school district leadership. Knippel said that the approach to improving safety included better crosswalks, street lighting, signage, traffic beacons or school zone lights, and extended school zone hours. Aldine school district has also accomplished the following: trimmed large trees to enhance lighting, provided additional police officers at traffic times, enforced right turn exiting MacArthur, considered crossing guards, added a beacon check weekly, communicated with all involved about pedestrian and car safety in school zones. A new traffic light and crosswalk is planned at Determined, Knippel said. The audience interruped a number of times, exhibiting an impatience in plans rather than implementation. They suggested adding a bridge over the street, traffic bumps, police enforcing student crossing, and not expecting the student to police themselves. Armando Walle, who personally came upon the fatal Torres accident scene that morning, spoke also about the need for families to change the behavior of the students. But he vowed to continue to help until the situation was improved. Knippel echoed this sentiment, suggesting that the students could be the “change agent” for improved awareness and behavior. One student, a girl wearing a #AllforJose shirt, made an emotional statement about missing her fellow student, and thought the district should state an appology for allowing the death to happen. Many in the audience felt that if students would arrive early, and school hours were extended, that this would help the situation. Superintendent Bamberg promised that the district will continue to work on solving the safety issues, and have another meeting to report in January. 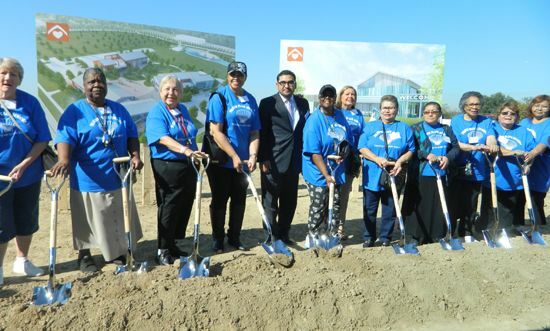 ALDINE – Neighborhood Centers held a groundbreaking ceremony last Wednesday morning, on the site of the new East Aldine Town Center. The new center is being constructed on a 61 acre plot on Aldine Mail Route, in the center of Aldine. It will include a Harris County 9-1-1- call center, a Lone Star College campus that will have an Aldine ISD early college component, outdoor park features, a commerical complex to included a major grocery store, offices for the East Aldine District, and the Neighborhood Centers campus. Planning for the center has been underway for almost two years, and much of the last year has been spent preparing the site, by removing large amounts of dirt overburden. Now two of the entities have broken ground, and the college has announced it groundbreaking for December 12. Acutal construction of all three projects is expected to start in February, and will take about a year to complete. Neighborhood Centers is a key to the success of this project, and the ceremony on Wednesday included many of the supporters involved in its realization. Speaking during the ceremony were Harris County Judge Ed Emmett, Pct. 2 Commissioner Jack Morman, East Aldine chairman Gerald Overturff, Neighborhood Centers CEO Angela Blanchard, NCI campaign co-chairs Murry Bowden and Marc Shapiro, and State Representative Armando Walle. Emcee for the ceremonies was Mike Ballases, chairman of the NCI board of directors. An especially emotional talk was made by Representative Walle, who was raised and educated in Aldine and MacArthur High, and spoke about how this project would raise the opportunities, and the esteem, for present and future generations. East Aldine chairman Gerald Overturff, who has lived all his life in Aldine, also spoke about the changes that have occured, and symbolized by this development. Neighborhood Centers CEO Angela Blanchard said that NCI goes where invited, and does what they are asked to do. In this case, she characterized their involvement as “putting a roof over a dream” and providing a better future for the whole community. She emphasized it was a partnership with many who helped. Harris County Attorney Vince Ryan has won a court order shutting down an unpermitted game room in North Houston where a security guard was murdered on November 6. On November 11th, Judge Sylvia Matthews granted Ryan’s request for a temporary restraining order to immediately close the game room based on imminent harm to the public. The lawsuit claims Bonifacio Alvarez Sanchez owns the land and profits from a game room operating without a permit in a mobile home at 534 Dale Street, a residential neighborhood near Aldine Mail Route. The lawsuit alleges that the game room is a haven for habitual criminal activity including illegal gambling, reckless discharge of a firearm, robbery, aggravated robbery and murder. Harris County Constable Precinct 1 conducted undercover gambling investigations on multiple occasions at the illegal game room. During the course of these investigations, Precinct 1 determined that the game room was engaged in illegal gambling. Additionally, a security guard at the game room was murdered by two gunmen during an armed robbery on November 6. The Harris County Sheriff’s Office is currently investigating the murder. This lawsuit is the result of the work of the Harris County Attorney’s Office with the East Aldine Management District. Since 2011, the County Attorney and the Management District have worked together to improve area neighborhoods by focusing on business owners that tolerate habitual criminal activity. On the heels of celebrating its 25th anniversary, the management district serving the community at the intersection of Interstate 45 and the North Sam Houston Parkway has changed its name to better reflect the area’s location and composition. 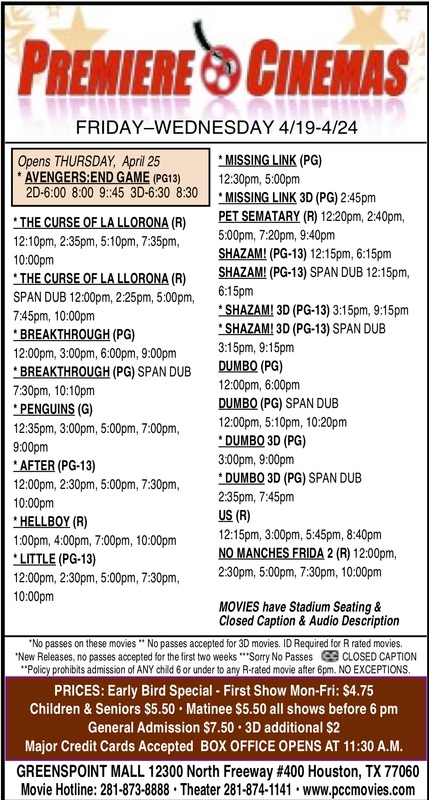 The Greenspoint District is now the North Houston District. “Our new name reflects a change that is already naturally occurring in the market,” said Greg Simpson, District president. “Many of our businesses strongly identify with a north Houston location, with some even using it as part of an official name. Our companies recognize the advantages of a close proximity to the airport and a central location between other activity centers like downtown and The Woodlands,” Simpson added. Being located at the intersection of two major freeways, the North Houston District promotes access to the greater Houston region as one of its major selling points. However, those freeways divide the community into quadrants that are developing differently. “When people think of this area, they typically focus on our northeast quadrant that includes Greenspoint Mall and some of our Class A office space,” said Bart Baker, the District’s executive vice president and chief operating officer. “But developments in our southwest quadrant, like the announcement of a new Amazon facility in Pinto Business Park, weren’t associated with our community. Since our new name is tied to our overall location and not a property, it will facilitate talking about development and activity throughout our entire service area, not just one section,” Baker said. After joining the organization in August 2015, Simpson restructured the Greenspoint District team to clarify the focus and goals of the organization moving forward. Now in his second year, he continues to position the organization to support the growth and address the challenges of its transitioning service area. “This community has undergone many changes over the past 25 years, and this organization has always stood ready to put in the work and build partnerships that have resulted in projects and improvements for the area,” Simpson continued. “Our commitment remains the same and we feel our new name allows us to better share with others what we are today. Even our new logo was designed with the symbolism of our location and quadrants in mind,” said Simpson. North Houston District staff can still be reached at the same phone number and physical address. The domain for emails and the Web site has changed to northhouston.org. Connect with the District on Facebook, Twitter and LinkedIn to stay up-to-date on the latest news. East Aldine’s Keith Wiess Park was the site of a family Fun Fall Fest for hundreds of kids and adults that spent the day in the beautiful sunny weather. 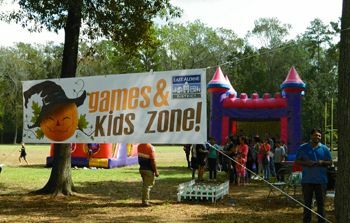 East Aldine District provided games, jump houses, soccer games, food trucks, fire trucks on display, free goodie bags and pumpkins, face painting, music by La Raza Connection, and Free Rides to the Early Voting polls, along with Neighborhood Centers. 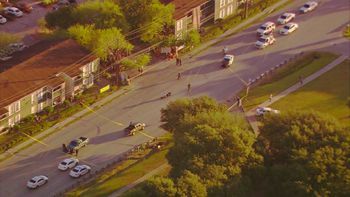 NORTHEAST – The community was shocked and saddened last week by two pedestrian deaths on Aldine Mail Route, as they attempted to cross the five lanes of busy traffic. Authorities from the county, and Aldine school district as well as State Representative Armando Walle are conferring, to look for solutions to this dangerous situation. On Monday, Oct. 24 at about 7 p.m. as it got dark, pedestrian Francisco Fuentes-Escobar was attempting to cross Aldine Mail Route, near Northwood Forest Drive. He was not in a crosswalk, however. He was struck by a 2003 Jeep Liberty, driven by Fernando Padilla, a 14 year old who was driving with friends, and on his way to pick up a relative. After hitting the pedestrian, he fled the scene, later returninga with his mother, who indicated he had taken the car without permission. He was arrested and charged with failure to stop and render aid. On Wednesday morning Oct. 25 at about 6:50 a.m., another accident took the life of a 17 year old student at MacArthur High School. Jose Torres was crossing Aldine Mail Route in the dark, from his apartment home directly across the street, to the driveway of the school. Because traffic was heavy in both directions, he stopped in the middle in a turn lane, waiting for a break. That was when he was struck by a pickup driven by by a 33 year old woman taking her own child to MacArthur. She was driving westbound in the turn lane, planning to make a left turn up ahead. However, authorities say she may have been exceeding the speed limit, which is 20 MPH in a school zone, and they estimated from evidence on the scene that she may have been travelling twice that speed or 40 MPH. However, to date she has not been charged. Torres was wearing dark clothing, and the street lights on the north side of the street did not shine enought light on the west or school side of the street, observers said. State Representative Armando Walle told the Northeast News that he was driving eastbound that morning with his two boys, headed for their school. Just before 7:00 a.m. he came upon the accident, which had just happened. With no emergency personnel or police on the scene, he used his own truck to block oncoming traffic and protect the boy, who was lying in the street, fatally injured. He noted at the time it was very dark, and no School Zone lights were flashing, even though they were supposed to be on. He talked to the woman driver, and a few witnesses, but left as emergency personnel arrived and took over. The first to arrive was an Aldine ISD policeman around 7 a.m. and a Sheriff’s deputy supervisor shortly thereafter. The mother arrived shortly after that, terribly distraught. Walle said that he is contacting county and school officials and the Sheriff to develop a solution to make the street safer. As of now, heavy traffic often speeds and ignores signals, witnesses said. Torres was one of four children, and interested in a soccer career. MacArthur students are holding benefit fund drives for the family.